Last month, Barnes & Noble had an optional display in the Children's Section featuring books about siblings. Since we had never done a display of picture books about siblings that I could remember in my sixteen years of working at the bookstore, I decided it was a must. I was especially pleased to find two of my newest favorites about the time before the new sibling arrives, There's Going to Be a Baby by Helen Oxenbury and John Burningham and Pecan Pie Baby by Jacqueline Woodson and Sophie Blackall on the display. I was especially pleased to discover two wonderful picture books that are new to me on the display as well! 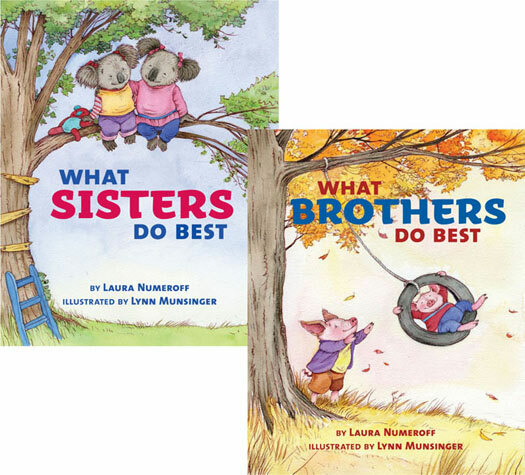 I am sure that you all know Laura Numeroff and her "If you give..." series of books, but she is also the author of four fabulous books about family, What Brothers Do Best/What Sisters Do Best, What Mommies Do Best/What Daddies Do Best, What Grandpas Do Best/What Grandma's Do Best, What Aunts Do Best/What Uncles Do Best. Numeroff is great at coming up with a circular story and this family of books is no exception. All four are flip books that, when you reach the half way point of the book, can be flipped and a new story is told. What is brilliant about Numeroff's books in this series is that the text for both of the books under one cover is identical. Brothers and Sisters, Mommies and Daddies, Aunts and Uncles, Grandmas and Grandpas can all do the same things with the sibling, child, grandchild, niece or nephew in the story, who the listener is encouraged to identify with. What makes the books worth buying are Lynn Munsinger's superb illustrations (scroll to the bottom of the review for more great books that Munsinger has illustrated) Although the text is the same, the illustrations are markedly different, making the books subtly different while remaining alike. Most little listeners I read to don't always pick up on the fact that the two books are exactly the same but what the main characters can do and how they do it is different. It is fun to show them this and watch their faces light up! For the most part, there are no gender stereotypes, which is what I love most about these books. Besides the fact that Numeroff is showing kids that mommies and daddies, brothers and sisters, etc., can do the same things, Munsinger's illustrations are often counter stereotypical. When the mommies and daddies bake cakes, the daddy's is the more accomplished, elaborate one. When brothers and sisters play pretend, they play tea party and cowboys. Every book ends with a centerfold that reminds the readers that mommies and daddies, brothers and sisters, aunts and uncles, grandmas and grandpa all give lots of love. These books are simple but perfect in their simplicity. Munsinger's illustrations are detailed and playful, filled with bright colors, adorable animals and sweet scenes of family life. Munsinger has also partnered with the fabulous Helen Lester on many books. While she may be most famous for her Tacky The Penguin books, I love her books that cover Berenstain Bear "life lesson" territory buy in a much less didactic, dry way. In Score One for the Sloths, slothfulness pays off when an energetic new teacher figures out a way for her class of sloths avoid having their school shut down for not meeting standards by getting them to perform their tasks and stay true to their tired natures. In Hurty Feelings a super-sensitive hippo named Fragility can't even take a compliment. When she is told she has sturdy legs she twists and responds, "You hurt my feeeeelings!... A piano has sturdy legs. So you think I have piano legs." She is so impossible that her friends begin to avoid her until an encounter with a bully helps her to look at things in a new way. And, in my favorite - especially fun as a read out loud - Wodney Wat (Rodney Rat) who can't pronounce his Rs but, when a big, bullying capybara joins the class, Rodney's speech impediment proves to be the secret weapon that stops Camilla in her tracks.